Lane’s depiction of the start of the first class yachts is chronologically the third in this group of four paintings (New York Yacht Club Regatta (2), 1856 (inv. 270), New York Yacht Club Regatta (3), After 1856 (inv. 396), and New York Yacht Club Regatta (1), 1856 (inv. 66)). They cannot be regarded as a complete narrative of the race, as three are focused on the start of only two of the three classes of yachts. The fourth is left to portray the finish of the first class in a very unusual way, with the winner lowering sail after having crossed the finish line. This image depicts the sloop “Julia” leading the first class yachts over the starting line on the first leg of the windward course to the stake boat off the Elizabeth Islands. Robert Bennet Forbes’s account of the race (in supplement below) indicates that “Julia” was followed by the schooners “Favorita” and “Haze.” This order is shown in the painting, but the other yachts do not seem to be in the order described. Sloop “Widgeon” and schooner “Twilight” appear out of place and are obscured by the other yachts and a spectator boat. The schooner at far left is the committee boat, “Emblem.” The steamer “Eagle Wing,” at far right, was chartered to carry sightseers who had come to view the regatta. While Lane’s depictions of the yachts’ appearances (if not their places) are reasonably consistent in the four views, his treatment of flags and owners’ “signals” (pennants) is not. Whether or not this was deliberate is debatable and cannot be determined from the fragmentary provenances of all but one painting (New York Yacht Club Regatta (1), 1856 (inv. 66)). There is also inconsistency in the way the schooner “Emblem” flies the Stars and Stripes and her name pennant. In New York Yacht Club Regatta (1), 1856 (inv. 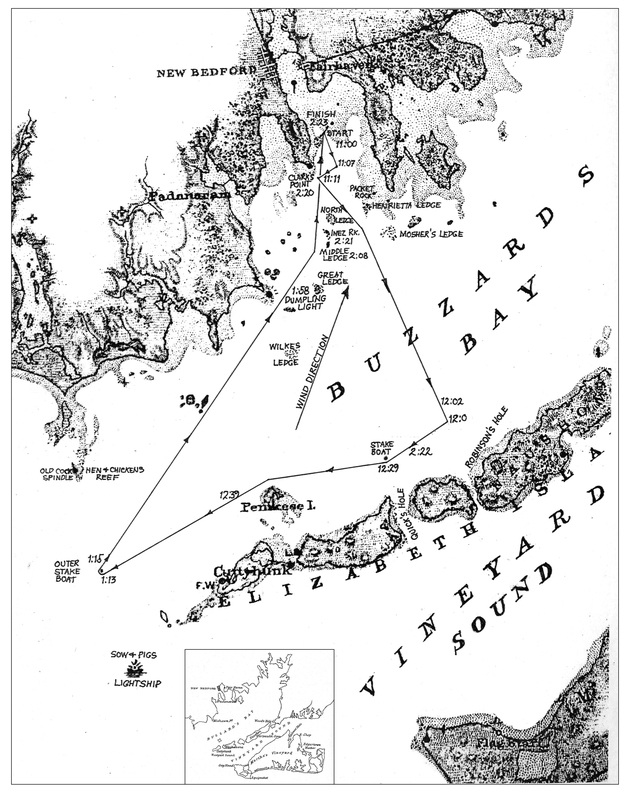 66) and New York Yacht Club Regatta (3), After 1856 (inv. 396), both are flown from the main topmast head. In New York Yacht Club Regatta (2), 1856 (inv. 270) and New York Yacht Club Regatta (4), 1857 (inv. 397), only her name pennant flies at the main topmast head and Old Glory is set from the peak of the main gaff. 1988 National Gallery of Art: National Gallery of Art, Washington, District of Columbia, Paintings by Fitz Hugh Lane, no. 36, ill. in color, 80, as New York Yacht Club Regatta (4). Wilmerding 1988a: Paintings by Fitz Hugh Lane, ill. in color p.80, cat. 36, as New York Yacht Club Regatta (4). Citation: "New York Yacht Club Regatta (4), 1857 (inv. 397)." Fitz Henry Lane Online. Cape Ann Museum. http://fitzhenrylaneonline.org/catalog/entry.php?id=397 (accessed April 22, 2019).